UCS is working to protect the public by pushing for steps to increase the safety and security of nuclear power reactors and spent fuel pools. 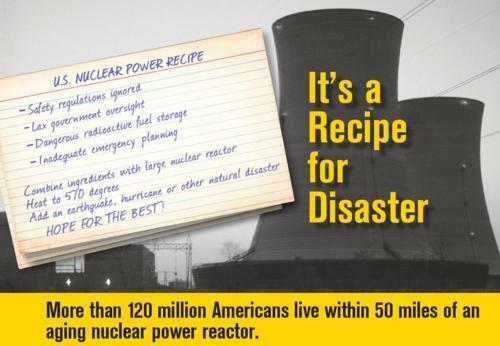 This is important since more than 120 million Americans live within 50 miles of one of the nation’s 104 operating nuclear reactors, and these reactors are not as safe as they should, and could, be. As part of our effort, in July we released a set of 23 specific recommendations to improve nuclear power safety and security in a report titled “U.S. Nuclear Power after Fukushima: Common Sense Recommendations for Safety and Security.”To highlight our concerns and to prod the public officials who are responsible for nuclear power safety and security—in Congress, the White House and the Nuclear Regulatory Commission (NRC)—to address them, we recently launched a public education campaign. Ads, like the one above, have run in New England and Washington DC. The campaign is also intended to help educate the public and local and state officials in the 31 states that have nuclear power plants about the measures needed to make nuclear power safer and more secure. UCS is neither for nor against nuclear power. Our goal is to protect the public by making nuclear power safer. Our campaign is intended to make sure we don’t go back to business-as-usual after Fukushima. What happened at Fukushima could happen here—and we need to strengthen safeguards to ensure that it doesn’t. UCS has acted as a nuclear power safety watchdog since its founding in 1969. Our Nuclear Safety Project is directed by Dave Lochbaum, a nuclear engineer who spent more than 17 years in the nuclear industry and more recently served as an NRC instructor. Among other things, Dave writes our weekly Fission Stories posts.